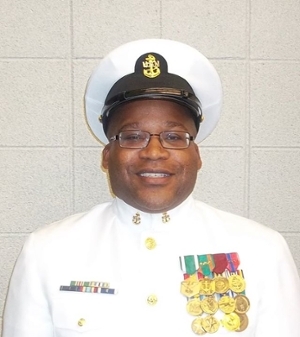 Southern Illinois University Edwardsville alumnus Chief Petty Officer Darryl G. Howlett Jr. recently retired from the United States Navy, concluding a career that took him around the world. During his service for the Navy Reserve, Howlett held positions for the U.S. Pacific Command as an information systems technician chief petty officer, leading chief petty officer, joint logistics directorate, reserve leading petty officer, ammunition logistics specialist, presentation specialist, information systems and administration help desk technician, command historian and public affairs officer. Howlett joined the U.S. Navy after graduating from East St. Louis Lincoln Senior High School in 1970. He completed naval boot camp training at the Recruit Training Command in Great Lakes, Ill. He served on the U.S.S. Taylor in Charleston, S.C., for four years before returning to East St. Louis to join the Navy Reserves and begin taking classes at SIUE. He graduated from SIUE in 1977, earning a bachelor’s in mass communications with an emphasis on print journalism and a minor in history. As a student, Howlett served as a reporter and editor for the campus newspaper, The Alestle. He was also president of the Iota Phi Theta Fraternity, Inc., Alpha Beta chapter. Howlett worked in information technologies (IT) for the first 11 years of his career. After being recalled back to active duty in 2001 in response to the September 11 terrorist attacks, he worked for one year at the Naval Air Facility in El Centro, Calif., providing base security, IT intelligence and public affairs assistance. It was then that he pursued a further career in public affairs. Throughout his career, Howlett received numerous accolades in recognition of his significant professional contributions. Colleagues praised his encouragement of sailors to never give up and to continue telling all who would listen the Navy’s story and of the great things they do for their communities. Photo: Chief Petty Officer Darryl G. Howlett Jr.